Wake up to love with Marci Shimoff, #1 NY Times author of Happy for No Reason, Love for No Reason, six Chicken Soup for the Soul books and featured in The Secret. Refresh your senses with this series of daily, 5-minute love messages with happiness expert Marci Shimoff. Marci Shimoff is a #1 New York Times bestselling author and one of the bestselling female nonfiction authors of all time. She is a world-renowned transformational teacher and is a featured teacher in the international film and book sensation, The Secret.She is dedicated to fulfilling her life’s purpose of helping people live more empowered and joy-filled lives. As an expert on happiness, success, and unconditional love, Marci has inspired millions of people around the globe, sharing her breakthrough methods for personal fulfillment and professional success. Her newest book Love for No Reason offers a revolutionary program for living in a state of deep and lasting love that doesn’t depend on another person, situation, or romantic partner. Her other books include the runaway bestseller, Happy for No Reason and six titles in the phenomenally successful Chicken Soup for the Woman’s Soul series. Her books have sold more than 14 million copies worldwide in 33 languages, have topped all of the major bestseller lists, and have been on the New York Times bestseller list for a total of 118 weeks. Marci is the also the host of the national PBS television special called Happy for No Reason. President and co-founder of the Esteem Group, Marci delivers keynote addresses and seminars to corporations, professional and non-profit organizations, and women’s associations. Marci’s messages have touched the hearts and rekindled the spirits of millions of people. You really can begin feeling and radiating unconditional love and compassion all the time, every day … bringing the highest and best part of yourself to your family, friends, your work, and your community. Let me tell you, living in this state of profound love will illuminate your entire Life! As you listen to these messages every morning, watch those old blocks to love fall by the wayside: walls that separate you from others will begin to melt, your wounds will heal, and your world will change… for the best! There’s no greater need in our world and in our personal lives today than for pure unconditional LOVE. 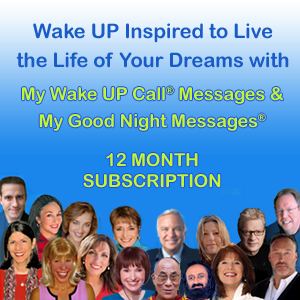 I want you to know that information in these messages is supported by the latest cutting-edge scientific research on the biochemistry of love along with ancient, time-tested wisdom and spiritual traditions from cultures around the globe. My goal is to offer you a revolutionary way to develop and maintain unconditional love from the inside out! My deepest wish is that you wake up to love every morning, and that your heart remains open and free.